← Celebrating the past and building for the future. Hyderabad is known for it’s cuisine, uniquely blending the traditional South Indian dishes with Mughlai from the North. The food is rich, aromatic and ghee is used in abundance. During our four-day trip we tried a few places that were recommended such as Ohri’s Tansen, Zafraan Exotica and the modern grill N. We skipped the usual recommendations Angeethi and the very popular Chutney’s. Ohri’s Tansen is located on Necklace Road close to the Hussain Sagar Lake. The place has a very good ambience and was a great place for lunch. It is an open airy space with a lot of natural light. 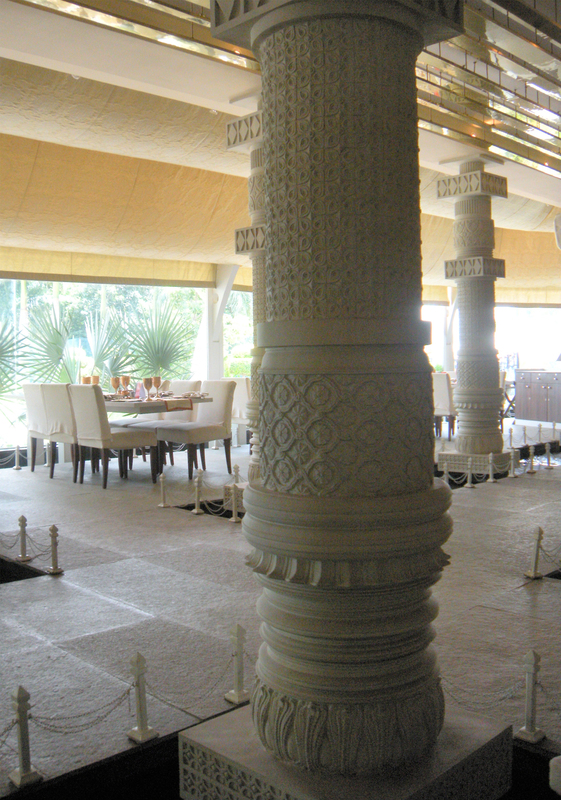 The sculpted pillars and a continuous water body gave the space a princely feel. 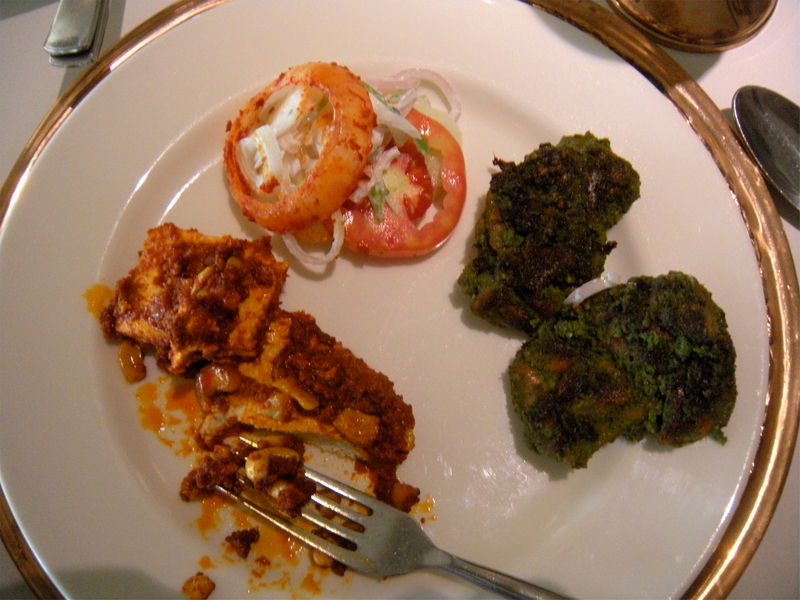 For appetizers we chose to order Roasted Ghee Paneer, Chicken Kali Mirch and a third appetizer that I cannot recollect. The Roasted Ghee (clarified butter) Paneer was rich, spicy and heavenly; garnished with cashews. The Chicken Kalimirch (black peppercon) was just right; the pepper was well-balanced with corriander and garam masala. On our last night we were treated to dinner by Jumeirah Janes family at Zafraan Exotica located in Banjara Hills. A rooftop dining experience with soft music and candle lit tables made a perfect setting for a shahi(royal) dining experience. We sipped on sangria as we ordered an array of appetizers. Mushroom buttons stuffed with Spinach and Paneer were truly exotic and I couldn’t have enough of them. We had to order the dum (slow) cooked Hyderabadi mutton Biryani. It was truly divine, I chose not to add the Mirchi ka Salan (whole green chilies pan-fried and simmered in a spicy peanut and sesame sauce), as traditionally added to Hyderabadi Biryani to truly be able to taste each of the spices from the saffron to the cloves. The meat was tender and juicy as well. I finished off with a small helping of some curd rice, a traditional south Indian dish – it was creamy and definitely had a cooling effect after the spice filled Biryani. With no room for dessert we had to skip the popular Shahi Tukda(fried bread soaked in milk) a Hyderabadi specialty. After two traditional meals on the last day my friend Rohini and I decided to try out N a modern grill. It is owned by a popular south Indian actor called Nagarjuna. The space is well designed with exposed architectural concrete and wood. An outdoor bar area is connected to a lounge. The lounge is raised and has a view of the dining level which is connected to an outdoor courtyard. During lunch on a week day the place had a business crowd and a lot of the tables were vacant. However it is believed that the lounge at night is a very happening place to be at. For appetizers we ordered Jalapeno Poppers which were a little disappointing, they lacked the required kick and were more cheesy than expected. As part of our main course we had tender and juicy New Zealand Lamb chops in a barbecue and chili sauce as well as the Grilled Chicken with a green harissa sauce served with brown risotto. 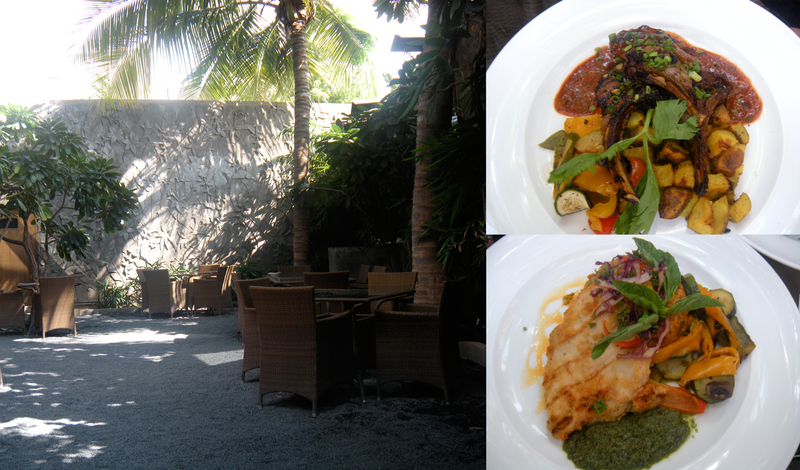 Both the dishes were very satisfying and flavourful. My friend and I had some good conversations and a great time. Definitely a good choice and hopefully on my next trip I will experience the N lounge by night. Our overall dining experience in Hyderabad was rich and heavenly. Dining service in general was attentive and the treatment royal. I definitely came back a few pounds heavier but definitely very satisfied. While in Hyderabad we did get to experience the nightlife as well. The last call at bars and clubs is 12:30am which was disheartening. We tried Ahalla at Taj Krishna and were sad to learn that they had a limited selection of top shelf liquor and drinks. Then the next night we went to Touch, it was Bollywood night so we danced silly to our hearts content. The song of the night was Muni Badnaam Hui. This entry was posted in Art, Culture, Food, Travel and tagged Culture, Food, Hyderabad, Indian, Interiors, Travel. Bookmark the permalink.